As advocates for motor vehicle safety and truth in the marketplace, we urge you to carefully scrutinize auto manufacturers’ marketing related to automated technologies. Today, we ask for your attention to Mercedes-Benz’s advertising for the 2017 E-Class, including a TV ad currently airing called “The Future,” which markets automated features available in the 2017 E-Class. This ad is likely to mislead a reasonable consumer by representing the E-Class as self-driving when it is not. The Federal Trade Commission (FTC) should take enforcement action against companies that falsely, misleadingly, or unfairly claim that their cars drive autonomously when they actually require the steady control of a human driver. We urge you to investigate Mercedes-Benz’s advertising as potentially deceptive to consumers. The E-Class does not meet the definition of either a fully or partially self-driving car, yet it is marketed in a way that a reasonable consumer would believe it does. In addition to a consumer possibly purchasing a car while being misled about its capabilities, the misrepresentations by Mercedes-Benz could give consumers a false sense of security in the ability of the car to operate autonomously. This misrepresentation is material because it significantly involves safety or is likely to affect a consumer’s conduct or decision with regard to the car. Is the world truly ready for a vehicle that can drive itself? An autonomous-thinking automobile that protects those inside and outside. Ready or not, the future is here. The all-new E-Class: self-braking, self-correcting, self-parking. A Mercedes-Benz concept car that’s already a reality. On-screen fine print reads: “Vehicle cannot drive itself, but has automated driving features. System will remind the driver frequently to keep hands on the steering wheel. Always observe safe driving practices and obey all state and federal laws.” Since debuting in March, this ad has aired nationally nearly 500 times, according to advertising measurement company iSpot. The fine print does not let Mercedes-Benz off the hook. According to FTC guidance, “advertisers can’t use fine print to contradict other statements in an ad or clear up false impressions the ad might leave” and “it’s against the law for businesses to bury important details about a product or service in the fine print.” The fine print in this ad certainly contains important details, and likely is intended to clear up false impressions that the images and voice-over may convey. 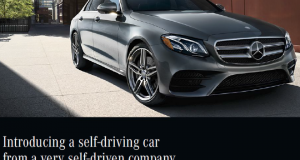 Reportedly, Mercedes-Benz also has placed print ads in magazines referring to the E-Class as “a self-driving car.” We include a portion of one of these advertisements below. Consumers deserve to be able to shop for a car without facing misleading marketing claims—particularly if those claims pertain to safety-critical driving functions. The FTC should defend its standard for clear and conspicuous marketing disclosures and take action against Mercedes-Benz for its potentially deceptive advertising. Thank you for your prompt attention to our concerns. Department+of+Transportation+Releases+Policy+on+Automated+Vehicle+Development) (press release). More specifically, vehicles classified at Level 3 – Limited Self-Driving Automation “enable the driver to cede full control of all safety-critical functions under certain traffic or environmental conditions” and are “designed so that the driver is not expected to constantly monitor the roadway while driving.” A vehicle classified at Level 4 – Full Self-Driving Automation is “designed to perform all safety-critical driving functions and monitor roadway conditions for an entire trip” and “safe operation rests solely on the automated vehicle system.” National Highway Traffic Safety Administration, Preliminary Statement of Policy Concerning Automated Vehicles (May 30, 2013). Several of our groups have noted a similar concern with regard to Tesla’s “Autopilot” package, which may present itself as being capable of greater automated control over the vehicle than it actually is. Federal Trade Commission, FTC Fact Sheet: The Devil’s in the Details (Aug. 14, 2013) (online at www.consumer.ftc.gov/sites/default/files/games/off-site/youarehere/pages/pdf/FTC-Ad-Marketing_Devil-In-Details.pdf). See “Mercedes ‘Self-Driven’ Advertisement Doesn’t Feature A Self-Driving Car (Update),” Jalopnik (July 15, 2016) (online at jalopnik.com/possible-mercedes-self-driven-advertisement-doesnt-feat-1783761678).